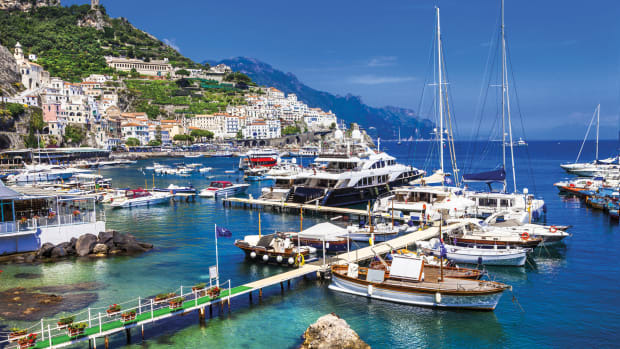 Just when it seemed impossible for another event to describe itself as the “Everest of round-the-world yacht races,” one has popped up on the radar that is, well, the Everest of round-the-world yacht races. The Brest Ultime Challenge is due to take place in 2019 and will be like the Vendée Globe in that it will be a singlehanded, nonstop round-the-world race. Like the Vendée, the race will start and finish on the west coast of France. However, instead of being raced on IMOCA 60 monohulls, the new event will be raced singlehanded aboard “Ultimes”—giant maxi-multihulls on the order of 100ft or more long. 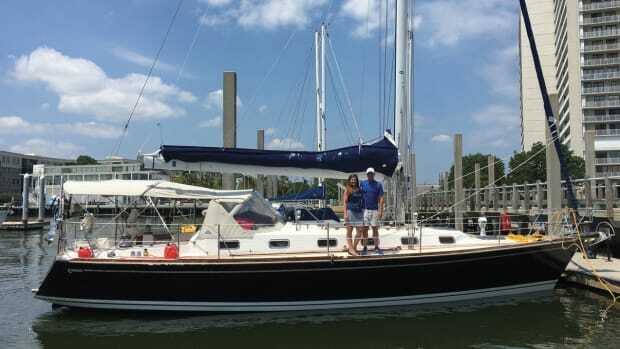 Since the 1970s, variousmultihulls have been sailed singlehanded around the world, hunting the solo record. This effort has been almost exclusively undertaken by Frenchmen, beginning in 1973 when Alain Colas aboard Manureva (formerly Eric Tabarly’s Pen Duick IV) became the first person to complete a circumnavigation on a racing multihull, in a time of 169 days.  Nearly three decades later, in 2004, Francis Joyon became the first sailor to complete a nonstop solo multihull circumnavigation. He also destroyed the record, in a time of just 72 days 22 hours and 54 minutes. At the time it seemed Joyon’s record would surely stand for years to come. However, just a year later it was not a gnarly Frenchman but a pint-sized 29-year-old Englishwoman by the name of Ellen MacArthur who reduced the record to 71 days 14 hours and 18 minutes aboard the trimaran B&Q Castorama. At 75ft, it was 15ft shorter than IDEC, but it was also the first boat to be designed purely to break the record for the solo multihull lap. Three years later Joyon recovered his record. This time, he too was sailing his own purpose-built boat, IDEC 2, aboard which he once again demolished the record, taking the time down to 57 days 13 hours and 34 minutes, which remains the time to beat. Meanwhile, on the design front, the multihulls conceived for breaking the solo round-the-world records continues to evolve. MacArthur’s B&Q Castorama, for example, which was designed by Nigel Irens and Benoit Cabaret, was based on the idea that an ORMA 60 tri’s rig size and righting moment was the optimum one to handle any degree of efficiency. However, that philosophy soon became outdated. In 2006 and 2008 two new maxi-trimarans, both designed by VPLP, were launched in France and conceived to take the Jules Verne Trophy, the outright fully crewed nonstop around-the-world record, which had been first set by Bruno Peyron and the crew of Commodore Explorer back in 1993. The 103ft-long Groupama 3 was built for future Volvo Ocean Race-winning skipper Franck Cammas, while Banque Populaire V, originally skippered by Pascal Bidegorry, remains the world’s biggest racing multihull at 131ft long. In 2010, Groupama 3 set a record time for the Jules Verne Trophy of 48 days 7 hours and 44 minutes, but two years later Banque Populaire V, with a crew led by Loick Peyron, circumnavigated in just 45 days, 13 hours and 42 minutes. Banque Populaire V also holds the west-to-east transatlantic record of 3 days 15 hours and 25 minutes at an inconceivable average speed of 32.94 knots—two knots faster than the Queen Mary liner managed when she set the Blue Riband record in 1938. Both of Banque Populaire’s records still stand. The most significant step in this tale of Ultime evolution—as the world’s largest trimarans are now called—occurred in 2010, after Franck Cammas set his Jules Verne Trophy record with a crew of 10 and decided that he was going to race the same massive boat in the Route du Rhum, across the Atlantic from St. Malo to Guadeloupe, singlehanded. To be fair, for the Route du Rhum Groupama 3 was fitted with a rig some 13ft shorter, and the southerly route Cammas took minimized the number of maneuvers he had to make. Nonetheless, his time was some 10 hours faster than the pre-race favorite, Joyon’s IDEC 2. Groupama 3’s Route du Rhum also proved that provided there was an individual at the helm with adequate experience and talent, solo-sailing a much more powerful boat, perhaps less efficiently, was faster than sailing a less powerful boat more efficiently. Although there are, perhaps, limits. In a move comparable to Alain Colas “racing” the 236ft four-masted monohull Club Mediterranée in the 1976 OSTAR, Yann Guichard raced the 131ft Banque Populaire V (now rechristened Spindrift 2) across the Atlantic singlehanded in the 2014 Route du Rhum, again fitting the boat with a shorter rig. He came second to Loick Petron sailing a smaller, more easily handled boat. The term “Ultime’”was first applied to these giant multihulls for the 2010 Route du Rhum, and incredibly, given the size of the boats, their cost and the difficulty of racing them singlehanded, the fleet has swelled—in large part because of the prospect of the ultimate race for these machines, the Brest Ultime Challenge. It also just makes sense. In a world where pretty much everything has been done, this event will be a genuine first, a milestone in our sport. Not surprisingly, this has captured the imagination of the French offshore racing elite. 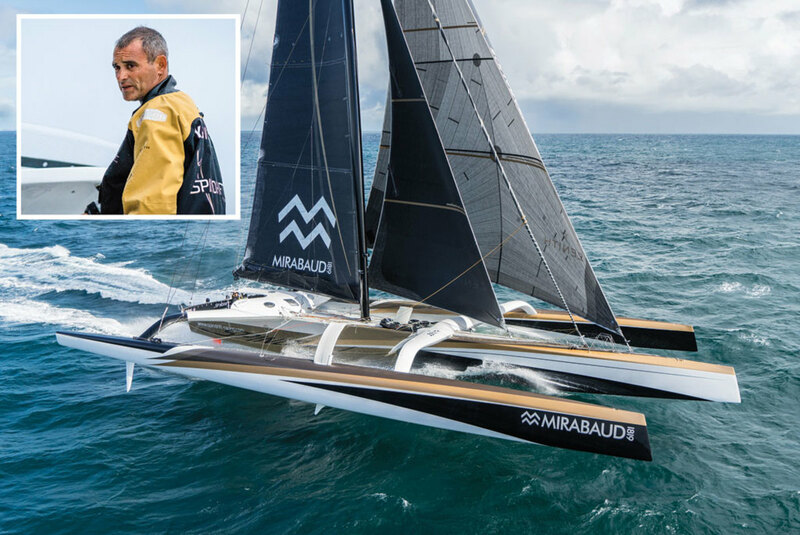 The original Sodebo trimaran was sold to Mini Transat winner Yves le Blevec and is now called Actual. 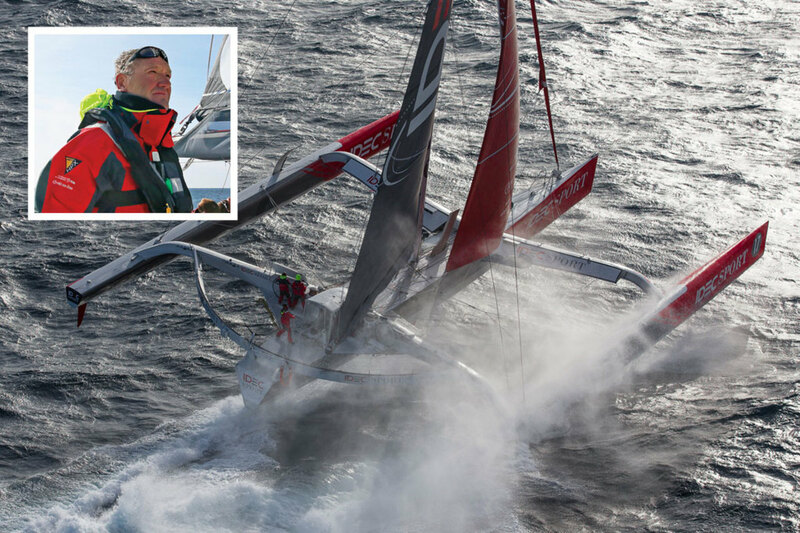 Francis Joyon’s IDEC 2 has been acquired by Chinese round-the-world sailor Guo Chuan. Renamed Qingdao China last year, it set a new record, sailing through the Northeast passage north of Russia from Murmansk to the Bering Straits. The former Groupama 3/Banque Populaire VII, winner of the last two Route du Rhums, is now Francis Joyon’s latest IDEC Sport. Spindrift 2 will be making another attempt on the Jules Verne Trophy record this winter. Due to her length it is unclear at present whether she will be permitted to enter the Brest Ultime Challenge. Sodebo Ultime is a 101ft trimaran, a recycled version of Olivier de Kersauson’s Geronimo, built in 2001. Launched in 2014, she uses Geronimo’s cross beams, albeit strengthened, but with a new 101ft mainhull and new bows on her floats, while her foils were all recycled from the BMW Oracle’s 2010 America’s Cup winning trimaran, USA 17. MACIF, a 98ft VPLP-designed trimaran built for 2012-13 Vendée Globe winner Francois Gabart, is the very latest Ultime, launched last summer. Since then MACIF was has won the Transat Jacques Vabre, the Transat bakerly and recently demolished the singlehanded 24-hour record, increasing it from 718.5 miles to 783.46. Just 10 years ago this run would have beaten the outright fully crewed 24-hour record. Beyond these, two other new Ultimes are currently in build, for Team Banque Populaire and Gitana/Edmond de Rothschild, due to launch next year. Both teams will be moving onto these after their respective skippers, Armel le Cleac’h and Seb Josse, have completed this winter’s Vendée Globe. Details are sketchy, but it is believed the new Gitana will be a full-foiling, flying boat, like a 21st century L’Hydroptère. So what is MACIF like, and how does Francois Gabart sail her? Obviously, the performance of the boat is a priority, and with multihulls this is less about overall length (as is the case with monohulls) and more about righting moment. The biggest indicators of this are overall beam and displacement. MACIF’s beam is 69ft, only slightly less than Groupama 3’s, but with a published displacement of 14.5 tons compared to Groupama 3’s 19, meaning she has the highest righting moment of all the Ultimes. Also vital to the design of such boats is dealing with the capsize issue, the Achilles heel of all multihulls. Back in the ORMA 60 days a decade or more ago, the boats were almost as wide as they were long and considered overly powerful for their length. This resulted in them frequently pitchpoling. To prevent this, racing trimarans have had more length placed in their bow. Rigs and their center of effort have also moved aft. While the ORMA 60s had their masts stepped on or around their forward beam, aboard the latest Ultimes the mast is stepped closer to the aft beam. On MACIF, for example, it is almost two-thirds of the way aft of the bow. This means the mainsail is also typically smaller with a shorter foot length, and therefore marginally less cumbersome to handle for a solo skipper, with more of the power coming from the headsails. For almost two decades now, the risk of pitchpoling on large racing multihulls has been further reduced by canting their rigs to weather. (Cranking over MACIF’s 115ft tall wingmast and sails is done via a giant hydraulic ram attached to each runner.) This alleviates the downward force on the leeward hull from the inclined rig. In addition, curved foils— similar to the foils used on inshore multihulls like the AC catamarans, GC32s and others—help to lift the leeward float out of the water, further reducing the risk of burying the bow. Today, it would take a giant rogue wave to pitchpole a large racing multihull. However, capsizes do still occur the old-fashioned way—laterally. Fortunately, MACIF’s sizable beam and righting moment help prevent this, as does her relatively-low-aspect sailplan. 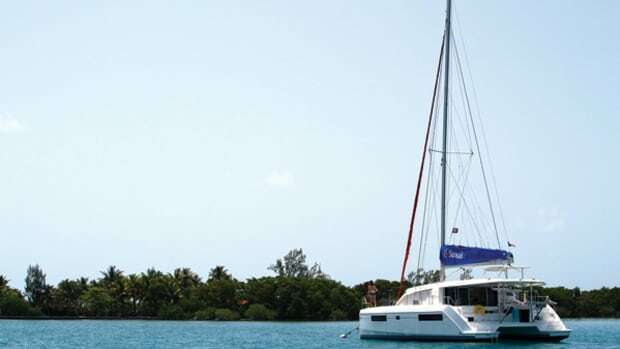 The mast on the 100ft maxi-monohull Comanche, for example, is some 39ft taller than MACIF’s, and Comanche carries 8,180ft² of sail upwind, compared to MACIF’s relatively meager 4,628ft². Being alone on board, Francois Gabart also won’t be pushing the boat to 100 percent of her potential, instead only putting the pedal down when conditions and sea state allow. Perhaps most surprising is how philosophically different French offshore boats, such as these and the latest IMOCA 60s, are compared to the VO70s and VO65s of the Volvo Ocean Race when it comes to protecting their crew.s Specifically, while the latter have relatively flush decks, leaving the sailors fully exposed to the elements, the former have gone entirely in the opposite direction. On the latest VPLP maxi-tris, for example, a giant cockpit is typically formed between the aft beam and the substantial semi-circular beam carrying the mainsheet track. There is also a cuddy in the middle offering protection for the crew and a cover over the companionway entrance down to the accommodations below. Finally, the steering stations to either side of the cuddy are protected by an extra screen mounted on top of the beam. This is considered not just a convenience but a necessity; under sail, water is being blasted aft constantly at 30 to 40 knots. In a slightly different approach, on MACIF the cuddy is replaced by a central pit area with wheels to port and starboard and, uniquely, a cabin at deck level aft of this. The whole area between the cabin forward to the aft beam is then not only equipped with a solid roof but plastic side panels to keep out the elements. 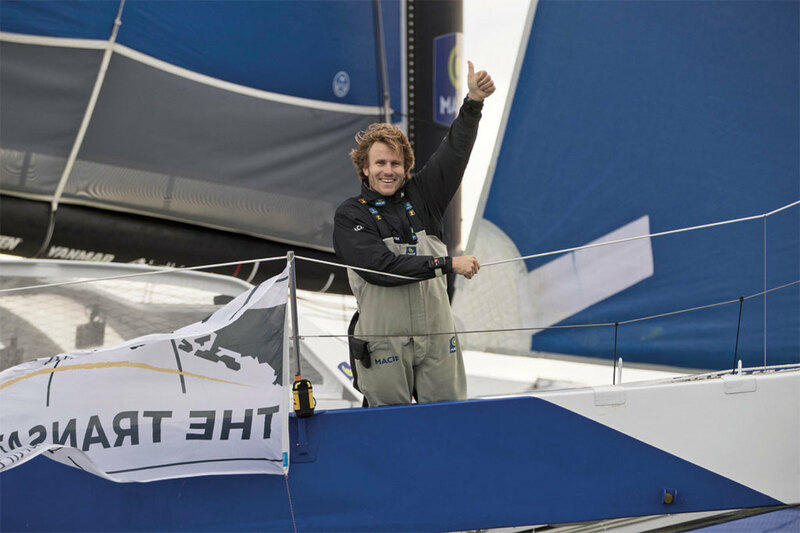 Thus, while he must leave the comfort of his on-deck suite to carry out sail changes, Gabart can do pretty much everything else from his enclosed cockpit. Granted, there is also substantial space down below for systems and stowage, but Gabart spends most of his time in the cabin where he has his nav area, galley and bunk, and he can sleep with the sheets literally in his hands—all just a couple of paces away from the working area of the cockpit. Given that Gabart reckons he spends around half his time on board grinding, grunting away on the single winch pedestal, the enclosed pit also means he can do this without having to have full oilskins on throughout. 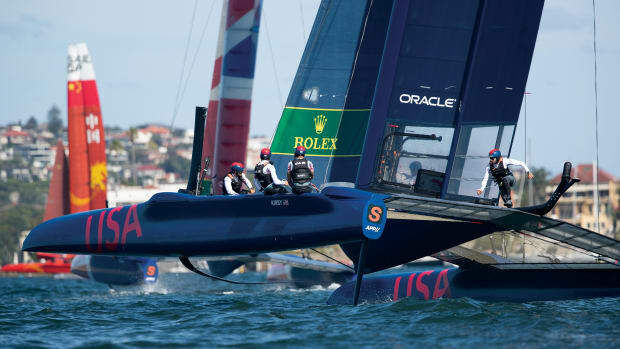 Thanks to developments in the America’s Cup, foil technology is also racing ahead in the Ultime class. 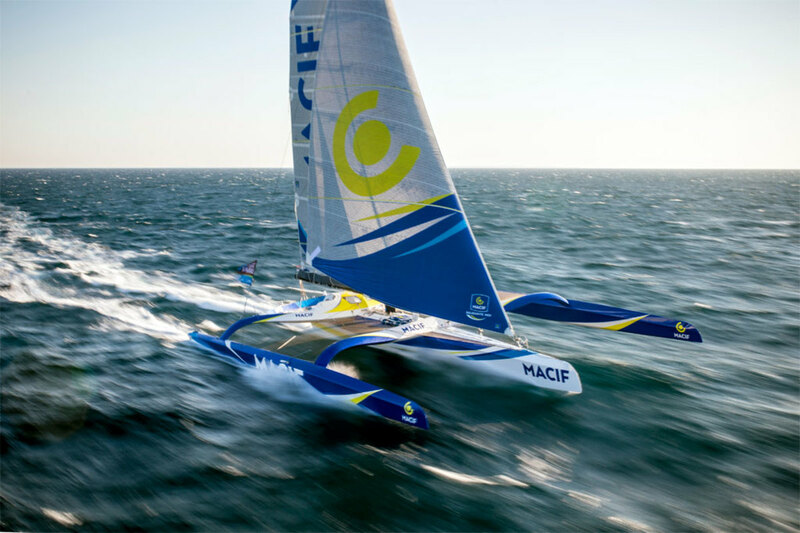 While previously trimarans like this had C-shaped foils, MACIF’s main foils in her floats are L-shaped, so that when lowered the foil creates more of a V-shape when passing through the water. While the rake of these foils can be adjusted manually, the V-shape means that the foil is inherently self-levelling. That said, while such foils are proven in flat water on AC72s, AC45s and GC32s, it is still early days when it comes to figuring out the best foil configuration is for use offshore in waves when the boat will be pitching more and the foils may not be continuously immersed. To complement the main foils, all three of MACIF’s rudders also have a horizontal surface providing vertical lift. Not surprisingly, Gabart says the foils are at present the main area of development, but progress is going well. Typically the foils are either fully up or fully down. However, given that they start working at north of 15 knots of boatspeed and that on MACIF this represents around 80 to 90 percent of the time, they will clearly see a lot of use. When deployed Gabart plays with their rake, which changes according to the point of sail and how fast the boat is going (i.e. the faster the boat is moving, the less rake and lift is required) and whether they’re in waves and need to keep the leeward bow up. At present, the rake of the rudders is fixed, but Gabart says that being able to alter this through hydraulics will be a future development. In above 25 knots or so of wind, and if the sea state allows it, MACIF can become a fully-flying maxi-trimaran, although occasionally the leeward float “flies” while the mainhull remains partially immersed. The foils are engineered to support the full weight of the boat and its dynamic loads, but full-foiling is something that even Gabart admits is possibly not prudent at this stage when sailing solo. “Sometimes you just see air under the hull and go, ‘OK now we’re flying.’It doesn’t feel that we’re flying because it is quite stable.” According to Gabart, the foils can contribute as much 5 to 6 knots of boatspeed. In terms of handling a boat like MACIF, there are five sails, including a main and four headsails, all on furlers. 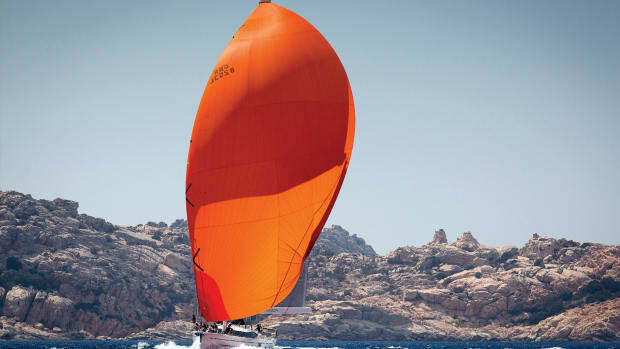 Unlike a fully crewed boat where there could be any number of sails for specific conditions, the aim on a singlehanded boat is to minimize sail changes. As a result, each of the headsails has a wide range. 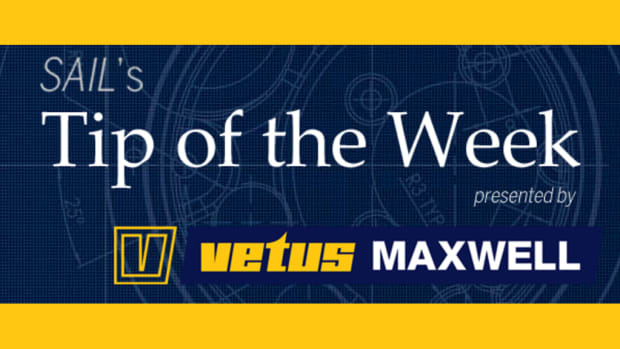 For example, the most-used headsail is the J2—upwind from around 10 to 22 knots and reaching up to 25 knots. Also, good news is that because the boat is so fast, the apparent wind is rarely much broader than a close reach, thus all the sails are very flat. On a large complex trimaran, there is a lot to do in maneuvers. For example, in a tack, the main looks after itself in terms of the sheet, traveller and mast rotation. 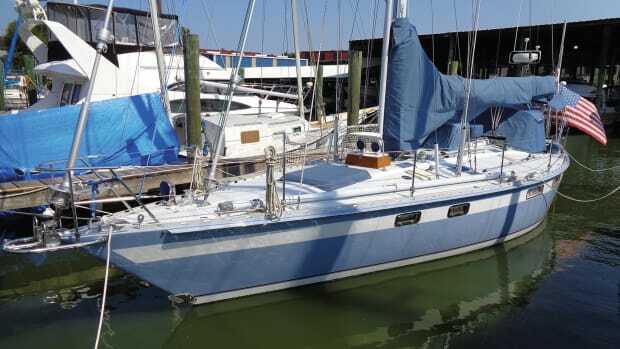 However, Gabart still has to dump the hydraulics for the mast cant, letting it drop to leeward, and tack the foils in the floats (these pop up of their own accord but require winching down), tack the headsail and the trim tab on the rear end of the daggerboard in MACIF’s main hull. Gabart says peeling between the biggest headsails takes around an hour, including getting everything squared away afterward. This is similar to the time it took him on his IMOCA 60 and one small mercy on the trimaran is that he doesn’t have to move the stack on his maxi-tri. Sometimes—for example, if the sea state isn’t good—Gabart will also gybe the boat rather than tack it, since although bearing away hard can be dangerous if the boat becomes overpowered, gybing avoids letting the large sails flog, which can cause them to become damaged. Prior to the Transat bakerly, the top speed Gabart achieved on MACIF was 43 knots, sailing downwind in 25 knots of wind while the boat was averaging around 35 knots. However, that was in big waves and Gabart reckons the boat could have gone faster if the sea had been flatter. That said, top speed is not as important as average speed and having set a new 24-hour record during which Gabart averaged 32.7 knots, MACIF has clearly raised the benchmark substantially. For the Brest Ultime Challenge, a group of Ultime teams have got together and appointed a central co-ordinator to develop a “rule” for the class. This has yet to be published but aims to prohibit extreme boats (if such things are possible) and to promote safety in the class. Given the leap in technology this class is already demonstrating through MACIF, these are truly exciting times for the world’s fastest offshore boats.